In the Pyrenees, valley Aspe and village of Accous. 3 rooms and 1 family room, each with private toilet and shower. Living room and kitchen. Garden. Label : Gîtes de France 3 épis. Near the National Park. 25 km from Spain. Our house offer 4 rooms, living room and kitchen. 2 rooms with double bed, 1 room with single beds, a family room with double bed and 2 single beds. The rooms are situated on the first and the second floor. The access is independent. Garden. 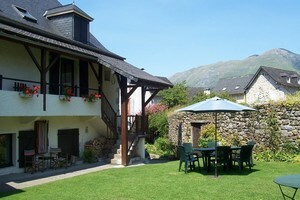 National park of Pyrenees, paragliding, tree climbing, climbing, trekking, trout fishing, eco-museum near the village. From PAU (60 km), and Oloron Sainte Marie (25 km) follow the national road 134 to Spain (Saragosse). Turn left to Accous and follow the signs " B&B gîtes de France". L'Arrayade, our house is in the village.